Where the aggressive demands of a polypropylene media filter is not required,the polyester media of the WRAS approved Pleat2 delivers an economic pleated solution for non-critical applications. Constructed from a single sheet of polyester media, this cost-effective prefilter is capable of reducing dirt, sand, sediment, silt, rust, scale and other particulates from incoming water supplies. The single sheet technology used in the construction means that the large surface area is able to deliver high-flow rates, maintain excellent dirt-holding levels and deliver extremely low-pressure drops across its range. Cartridge integrity comes in the form of its bonded vinyl plastisol end-caps,fusing the pleat pack around its tough inner polypropylene core. Designed to fit a wide range of industry standard housings in 47/8" to 40"configurations, with large diameter options, the Pleat2 is the ideal choice for many market applications in either pre- or final stage filtration. 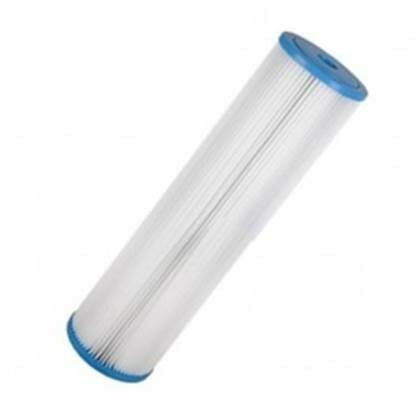 SPE-20-93/4 Spectrum Pleat² Polyester Pleated Sediment Filter 20μ 9 3/4"